Hi my name is Katy, and this year I don't just like Christmas, I really like Christmas. I'm not sure whether it's because I actually own a real tree this year, the fact that we've already been celebrating the festive season for the last few weeks, or maybe because I'm home a little more and *ahem* watching Christmas films. BUT I am absolutely loving it. Our home feels all cosy, and Christmassy. And it's nice. And even though I might not have tackled the Christmas shopping yet (I just, can't even think about it. 15 days is still plenty of time surely? ), you can bet that we've been preparing ourselves with cheeseboards, mulled wine and plenty of peanuts. Actually, that's a normal evening in our house. Just in even bigger doses for December. Like most years, we spend our time with both families, and as we're not the cooks (we have to keep up our chief eating titles), we never want to turn up empty handed. 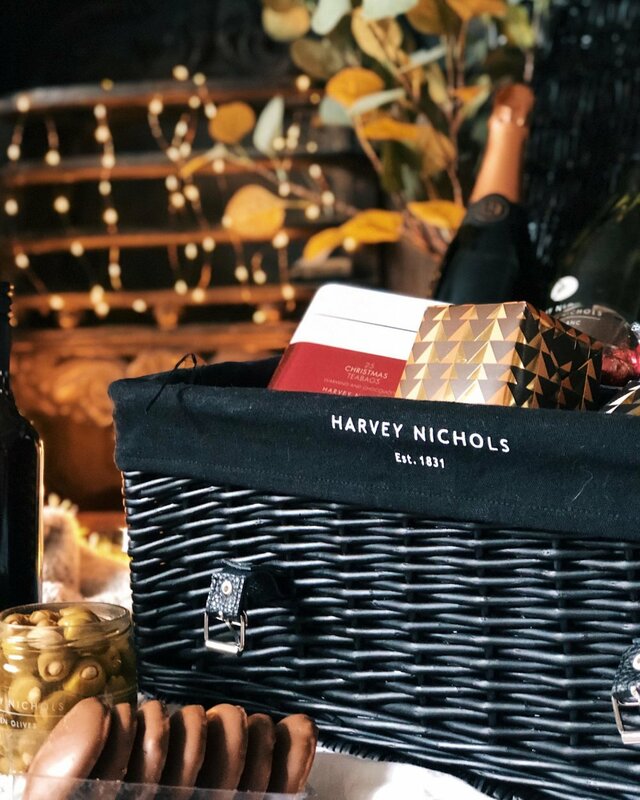 So when Harvey Nichols* got in touch and wanted to send one of their Christmas Hampers to enjoy, we knew this would be the perfect thing to arrive at our families houses with (also, we have grandchildren to compete with). Sharing is caring after all.However, we just couldn't resist some of the treats. When it's cold outside, you need Malbec. When there's Cheese and Fennel Straws, on offer you need to try them (and then some more). And, when there's a mouthwatering tin of Salted Caramel biscuits staring right at you, you almost shouldn't wait to try them. And trust us, those salted caramel biscuits are delicious. So delicious, that we finished all seven of them. I guess you can say that we were taste testing ahead of sharing. Regardless of what we ate, there's still a whole lot of Christmas delights tucked inside the gorgeous hamper - so we sure won't be turning up empty handed. *I was kindly gifted the Harvey Nichols Hamper, however all views and photography are my own.